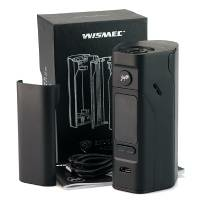 Wismec - Reuleaux RX2/3 Kit - Black is the Box for expert vapers, powered by two or three batteries can reach 150W or 200W respectively and can work both in TC mode and VW. Wismec - Reuleaux RX2/3 Kit - Black is a box mod for expert vapers, powered by two or three batteries, can reach 150W or 200W respectively and can work both in TC mode and VW. The software of this fantastic box can be upgraded via the dedicated USB cable provided inside the kit.